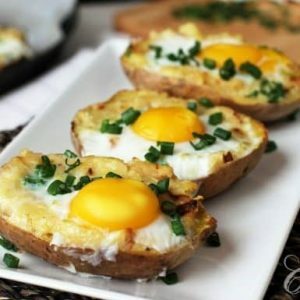 Here’s a great idea for breakfast or brunch that combines our love of baked potatoes with a nutritional boast of fresh eggs. You can spice it up with some fresh salsa if you prefer a hot start to your day. Combine it with some fresh fruit, bacon or sausage, coffee or tea and you’re all set. Scrub potatoes, pierce them with a fork and put them in the oven for 30-40 minutes until soft. In a large frying pan heat oil or butter over medium high heat. Sauté the onion with garlic for about 5 minutes until soft. When the potatoes are cool enough to handle cut the potatoes in half lengthwise, scoop the interior out of each leaving about 1/4 inch shell of potato flesh and skin. Add the scooped out potato flesh, grated cheese, salt and pepper into the pan and stir well to combine. Place the potato shells on the baking sheet and fill them with the mixture. Press the mixture with a spoon so a hole is formed to make space for the eggs. Sprinkle chives on top and crack an egg on top of each half potato. Cook at 200°C (400°F) for 10-15 minutes until the egg is set. The whites should be set while the yolks are a bit runny.